Everyday Biscuit (our dog) and I take a walk. We have our patterns and variations on a theme but we regularly follow the same route. Our route takes us past several areas that currently be used for field corn. Eventually, these areas will be developed into either residential or business uses. Over the past few summers I have seen an increase in milkweed plants. I was very excited to see milkweed on the edges of the corn field and hoped the Monarch butterflies would be equally excited. Last summer I noticed a disturbing trend. The farmer pushed further than he had in previous years and could be plowing under more and more milkweed. Coincidentally this summer a friend, native to this area, was sharing how she used to see fields full of Monarchs and that she had not seen one Monarch at all this past summer. On one of my walks looking at the seeds of the milkweed ready to take flight I began to wonder if I could save milkweed seed and start some on my own. If I could I thought they would be a great addition to our native and butterfly planter. Sure enough you can propagate wild milkweed. I ended up using Wild Ones’ website. They promote native plants and landscaping, which was what I was the type of website I thought would be most helpful to me. I did not want to use the milkweed in a way that was outside its preferred characteristics or unknowingly unleash an invasive plant in my community. They have a nice milkweed fact sheet to help the average person, like me, propagate and learn about milkweed. Milkweed is the only food source for Monarch larva. If, for example, the plants in my neighbor hood get mowed down next summer what or who is going to replace that food source. Hopefully, I can help build up the milkweed population in my area in places that will be more stable than along my walking route. So what have I actually done so far? This fall I harvested a few seeds from a few plants. I tried not to take to much from the plants, but just enough for my purposes. I pulled off all the fluff and keep them in a cool, dry place. 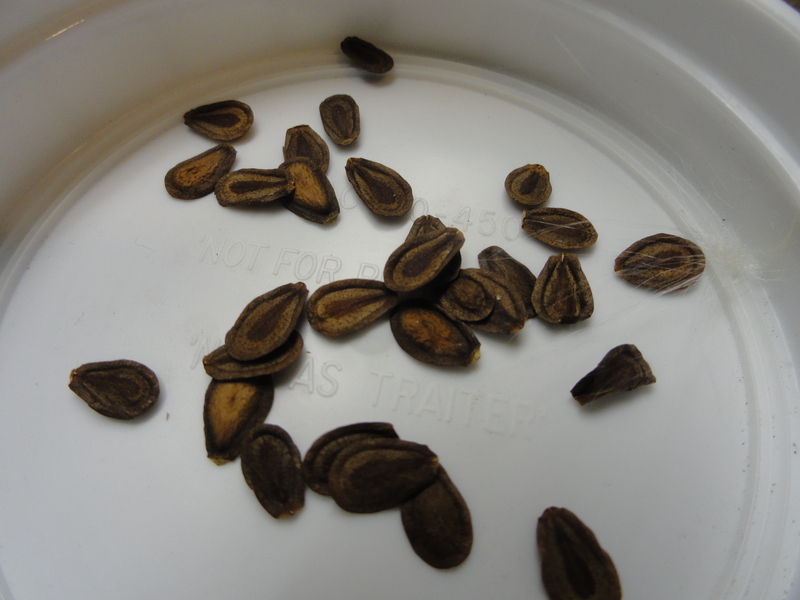 A few of my milkweed seeds. I did some simple research and I believe I have Common Milkweed or Asclepias syriaca. 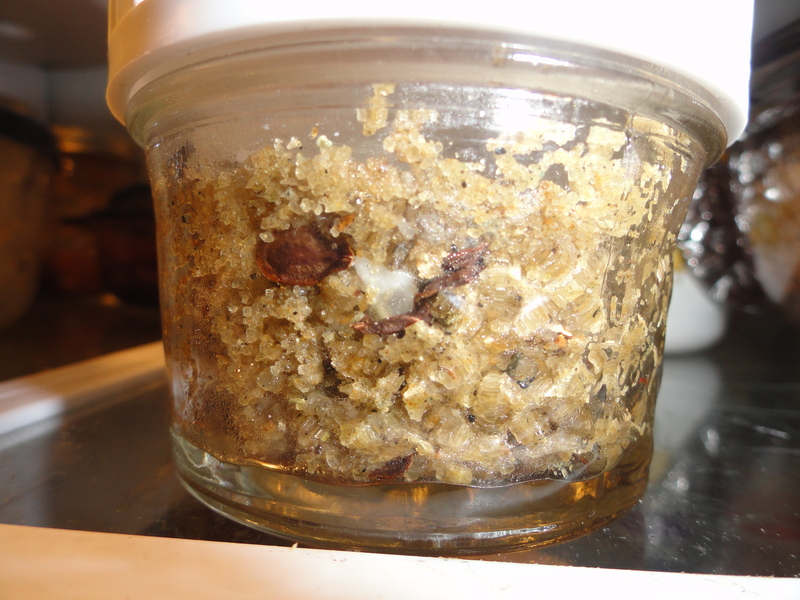 Today they were mixed with sand, according to the Wild Ones’ instructions and were placed in our refrigerator. The process is called stratification and it is to create a simulated winter experience for the seeds. Wild Ones recommends sixty days for common milkweed, but the USDA recommends ninety days. I am trying sixty plus a few days to see what will happen. In about sixty days I will start the milkweed seedlings. It should be interesting to see how it works out. I am hoping to be able to help provide some food for local Monarch butterflies. I would encourage you to watch for milkweed and try planting around your home to help feed the Monarchs. I have heard several reports about the Monarch population is declining. Maybe this will be one more piece of the puzzle to help increase the population of this wonderful butterfly.